I've always been looking for a tablet solution that I could use to take handwritten notes that would convert to text. On my Nexus 7 I tried MyScript Smart Note and on my iPad Air I tried MyScript Memo. That both platforms ended up with MyScript apps was just coincidence. But the coincidence doesn't stop there. 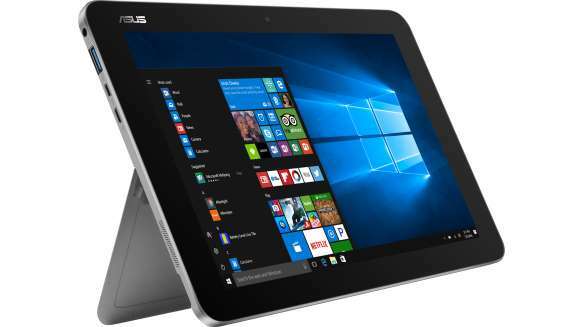 The Microsoft store carries the Asus Transformer Mini in a Signature Edition. The keyboard snaps on magnetically like the Microsoft Surface. And when you flip it around behind the tablet it is not sensitive to touch. It also has a kickstand like the Surface when you're using it on a desk. The keyboard has a small loop to hold the pen. While the Asus Mini comes with its own charger you can simply use any microUSB charger. And you can easily make it all day on a single charge. The light weight is impressive. Even with the keyboard the Asus Mini weighs 1/2 as much as the ThinkPad X220 that I was using and that's without the ThinkPad's charger. For protecting the Asus Mini I got a sleeve from eBay. The one for a 10" tablet fits fine and I even store the Asus' pen in it. The sleeve protects the Asus Mini when you are traveling with it but I wanted to protect it from scratching when I set it down on a rough surface. I found a faux carbon fiber skin for a Macbook. A few minutes with a razor blade and it looks like it was made for the Asus Mini. It came with Windows 10 Home but I upgraded it to Windows 10 Pro with a key from SCDKey. I didn't have to have an new DVD. I just entered the key and sat back a couple of hours. Don't forget to cleanup the old files when you're satisfied with the upgrade. Then I did a Windows 10 "reset" just to make sure it was clean. That took another couple of hours. It also comes with a free copy of Office Mobile. While this is somewhat limited the functionality is fine for casual usage. It's a little bit picky about which versions of Word documents that it will open for update but it will convert most versions to the current format. But the magic is the handwriting app. The program I use for handwriting is Nebo from MyScript (remember them?). I got it for free right after it was released. And I'm not the only one impressed by Nebo. Nebo supports exporting to Microsoft Word. Handwritten notes can be exported to Word or saved as text. Headings, paragraphs, lists, color, bold, highlight, are all preserved. I use the "View in browser" feature to save as PDF. In that the Asus Mini has an active pen, the Nebo app is insensitive to your palm touching as you write. The MyScript apps that I have used on other tablets have tried to address this with a palm "screen" but are generally unsatisfactory. Besides its handwriting function don't forget it's a full Windows 10 PC, e.g. Chrome, Dropbox, etc. Yeah, it's not the fastest but everything works. If you need more disk space than the 32GB drive provides you can add a microSD card. I still have more than 20GB free on the internal drive. I've been burned before when I link to a web page in this blog and then it disappears. (I'm talking about YOU Microsoft.) Sometimes I will even screen capture the pertinent parts of the web page and present it as a jpeg. 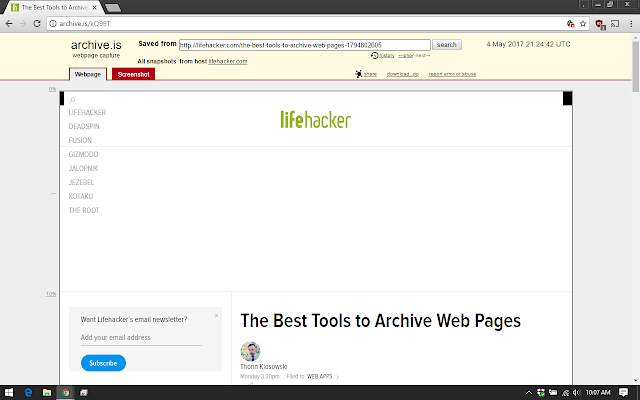 Recently I came across this article in Lifehacker that mentioned archive.is. The idea is that archive.is will go capture the web page at the point in time and give you a shortcut to it. Further you can download a zip file with a stand-alone presentation of it. 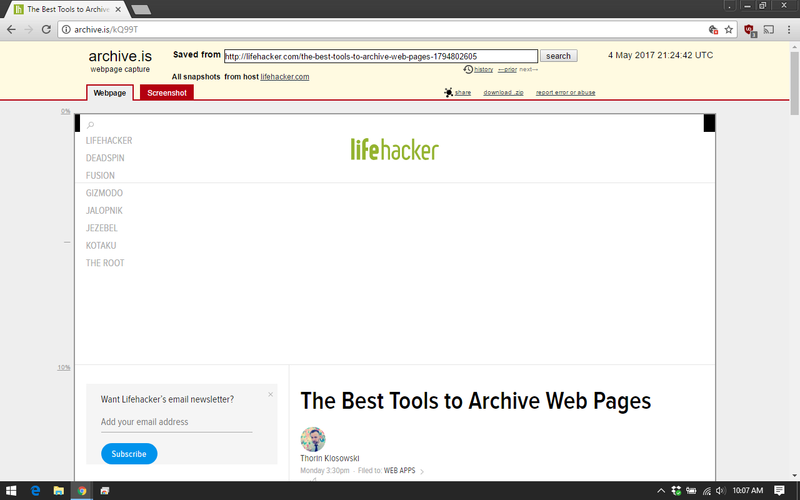 Here is the archive.is copy of the Lifehacker article. You still have the risk that archive.is goes away. I don't see any ads so I'm not sure of the business model. I probably switch phones as much as anyone you know. I have loved my BlackBerry PRIV. And I don't use the physical keyboard. So I crossed over again. I found a refurbished carrier unlocked 64GB iPhone 6s on eBay for a great price. I Google-ized it and avoided the iMessage trap (so far). The phone I got is model A1688. A1688 is known as the "everywhere" phone and supports all the LTE bands that the AT&T variant (A1633) does except that there is no LTE band 30. AT&T uses it as a supplemental band to increase capacity in urban areas. It has worked fine for me on AT&T even supporting HD Voice. The A1688 also has CDMA so it supports Sprint and Verizon. While my BlackBerry PRIV supported Android Pay my bank didn't support my debit card on Android Pay. Apple Pay is supported and works great. As I mentioned before I struggled to get my photos off the iPhone. What I'm doing this time is letting Google Photos back up the photos. Google Photos actually seems to upload sooner on iOS than on Android. I can't explain that. I use Air Transfer to download the photos to my PC from the Camera Roll then delete them from the Camera Roll. More on Air Transfer in a future post. Given that Google is fumbling their messaging solutions I had already separated my carrier's SMS messages from my Google Voice text messages. I still can't set a custom notification tone for Google Hangouts. GasBuddy updated their Android app and made it less friendly than on iOS. No loss there. Google has ported their keyboard to iOS so that's familiar. Apple still is insistent on not using an alternative keyboard for password or lock screen widgets but it's better than the Swype problems I had before. I found Call Friends to create direct dial icons This works fine. If you hit the limit of 2 free icons just uninstall and reinstall. The iPhone 6s' Touch ID works much better than the iPhone 6's. In the above chart, notice in Camcorder Features the iPhone has Digital Image Stabilization. Here's an example of that. iPhone users just don't understand what they're missing. My friend laughed and said "Yes I do!" As I mentioned in this post when I built "The Trump" I used Windows Storage Spaces to create a mirrored data drive. For the Storage Spaces I used Microsoft's Resilient File System (ReFS). ReFS was relatively new to the consumer space as I had problems even finding a backup solution. Recently though Winaero had an article on ReFS. I don't understand some of the statements in this article, e.g. "ReFS is intended for file servers only. In Windows 10, it is in fact locked for server OS only." I'm using ReFS just fine on Windows 10 Pro 1607. Regardless of the details, the Winaero article lays out the advantages of ReFS better than I'd seen before. These details came from Microsoft. Integrity. ReFS stores data in a way that protects it from many of the common errors that can normally cause data loss. When ReFS is used in conjunction with a mirror space or a parity space, detected corruption—both metadata and user data, when integrity streams are enabled—can be automatically repaired using the alternate copy provided by Storage Spaces. In addition, there are Windows PowerShell cmdlets (Get-FileIntegrity and Set-FileIntegrity) that you can use to manage the integrity and disk scrubbing policies. Availability. ReFS prioritizes the availability of data. Historically, file systems were often susceptible to data corruption that would require the system to be taken offline for repair. With ReFS, if corruption occurs, the repair process is both localized to the area of corruption and performed online, requiring no volume downtime. Although rare, if a volume does become corrupted or you choose not to use it with a mirror space or a parity space, ReFS implements salvage, a feature that removes the corrupt data from the namespace on a live volume and ensures that good data is not adversely affected by nonrepairable corrupt data. Because ReFS performs all repair operations online, it does not have an offline chkdsk command. Scalability. As the amount and size of data that is stored on computers continues to rapidly increase, ReFS is designed to work well with extremely large data sets—petabytes and larger—without performance impact. ReFS is not only designed to support volume sizes of 2^64 bytes (allowed by Windows stack addresses), but ReFS is also designed to support even larger volume sizes of up to 2^78 bytes using 16 KB cluster sizes. This format also supports 2^64-1 byte file sizes, 2^64 files in a directory, and the same number of directories in a volume. Proactive Error Correction. The integrity capabilities of ReFS are leveraged by a data integrity scanner, which is also known as a scrubber. The integrity scanner periodically scans the volume, identifying latent corruptions and proactively triggering a repair of that corrupt data.